General Washington implored Congress to pay debts due to Revolutionary War soldiers and other creditors when the colonies obtained independence in 1783. Congress, however, had no power to tax and states refused to pay. Washington–who had returned to private life–wrote three years later that “we have probably had too good an opinion of human nature when forming our confederation.” He compared the situation to a “house that was reduced to ashes” while people debated “the most regular mode of extinguishing” the fire. In 1787 he agreed to return to public life by attending and then presiding over a meeting to decide what to do next, a meeting that produced a Constitution that included a Congress with the power to tax. On leaving office Washington asked his fellow citizens to “discharge the debts” rather than “ungenerously throwing upon posterity the burden that we ourselves ought to bear.” In the next dozen years Congress, and the Jefferson and Madison administrations, devoted much of federal revenues to debt reduction, and paid down debt by almost 50 percent even though they borrowed to make the Louisiana Purchase. Today balanced budgets, much less debt reduction, would be called “austerity,” but the United States grew in its early decades while paying down debt. Debt repayment freed savings for use in private enterprise and reserved credit for use in emergencies. The nation needed every last penny of that credit during the War of 1812, which ended just days before the US was scheduled to default on its debt service. 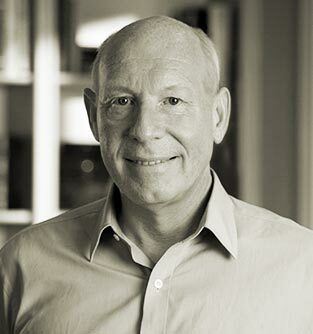 Bill White has done something remarkable – he’s written a fascinating book about our economic history that you don’t have to be a policy wonk or historian to enjoy. America’s Fiscal Constitution tells the story of how America has dealt with its debt since its founding, and in doing so provides a compelling roadmap to a more responsible fiscal future. Bill White’s lucid and pioneering book places the explosion of the national debt in the context of American history. He offers a compelling and illuminating formula for both economic growth and fiscal restraint. If you don’t know history, you’re bound to repeat it. 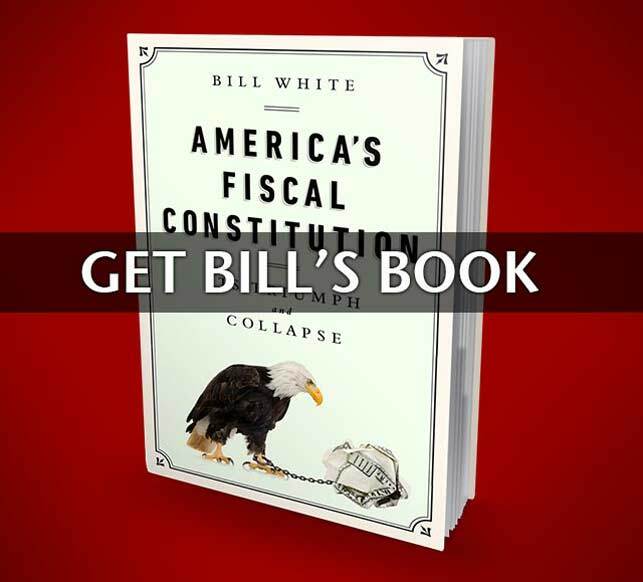 Bill White’s thorough understanding of both finance and government allows him to trace the history of America’s path to the edge of fiscal irresponsibility. His book, America’s Fiscal Constitution: It’s Triumph and Collapse, is a must read for all who want to understand the difficult decisions needed to put America’s fiscal house in order. Bill White focuses directly on the gimmicks, obfuscations, and, on rare occasion, the courage with which Congress has approached our looming debt crisis. Our federal statutory debt is now larger than the entire American economy. This is unsustainable. Everyone needs to read this book . . . now. In order to understand our fiscal plight, it’s crucial to appreciate how carefully America has dealt with debt in the past. Bill White makes that tale fascinating. The result is cautionary but also inspiring. We can deal with this issue if we embrace the values inbred in our system. Every concerned citizen should read this book. There are few Americans I believe in and trust more than Bill White. In America’s Fiscal Constitution, White tackles the Godzilla issue of federal debt. With history as his guide, White trailblazes through the Washington, D.C. bureaucratic jungle, revealing Big Truths to the reader that are bolstered with Hard Facts. This should be required reading for every American citizen! Quite simply, our nation cannot be strong militarily, diplomatically or politically unless it is strong economically, and we cannot remain strong economically unless we deal with our massive debt burden. 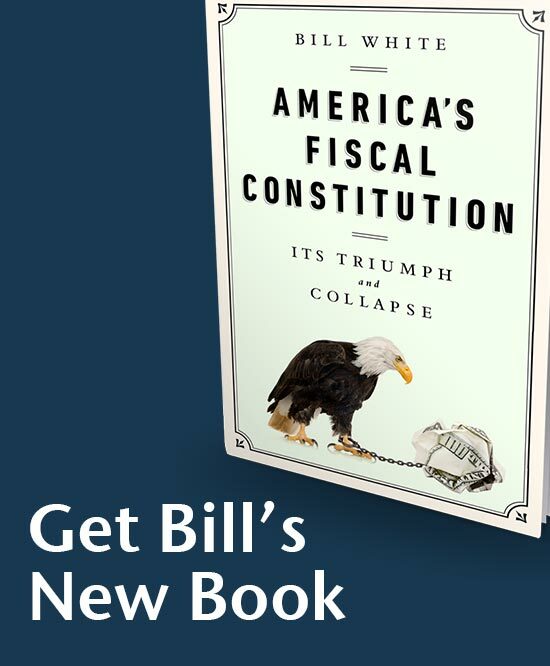 Bill White’s book, America’s Fiscal Constitution: Its Triumph and Collapse, is a must read for those who believe that we should get our economic house in order. Bill White has produced a remarkable book. Powerful, penetrating and persuasive on the need to get back to our roots of responsible budgeting. It is a tour de force of our fiscal history. Bill White deserves a gold seal for a clear and compelling call to get America back on track. How can we return our federal government to a sound financial footing? Bill White’s thought-provoking and well-told history of our nation’s traditional financial principles is a great place to start. Every citizen can benefit from this book’s practical insights.